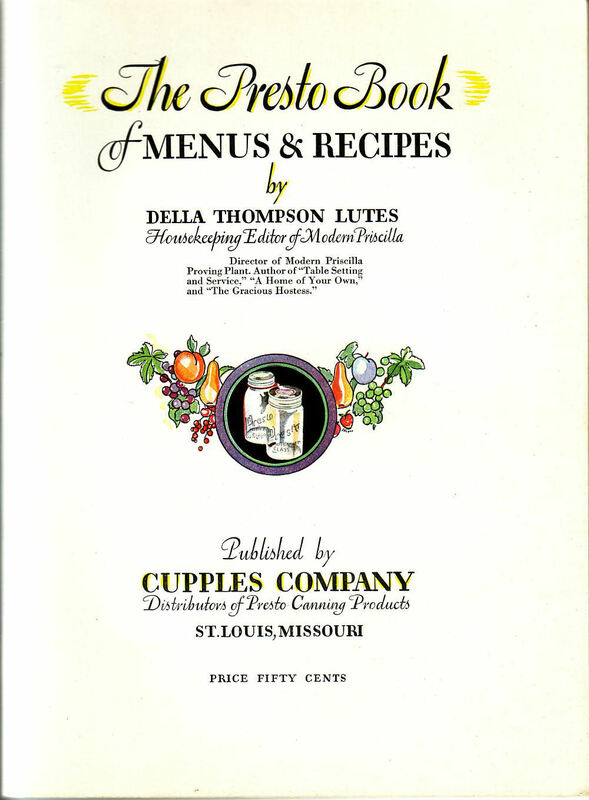 I think “The Presto Book of Menus & Recipes” by Della Thompson Lutes (published by Cupples Company, St. Louis, MO) is my favorite of all my pamphlets so far. Internet research indicates that it was published between 1928 and 1930, based on the publication dates of Lutes’ books and the fact that the magazine Modern Priscilla ceased publication in 1930. Plus, the booklet is lush. The cover is beautifully marbled heavy paper (unfortunately defaced on my copy with a scribbled indelible price!) and an embossed title section. The interior contains not only colored illustrations – not only color (color!) photographs by Paul Weir Cloud of Boston – but prints of watercolor paintings taking up two-thirds of the page at the start of each section. It’s just so pretty! It is not, I believe, a Depression-era publication. Presto was (and is!) a canning jar company. The booklet has a section about canning methods and equipment, followed by seasonal menus and recipes, followed by a section on meal planning and nutrition. The recipes, not surprisingly, rely on canned foods mostly. Whether they’re any good I can’t say (yet). Drain liquid from lima beans, chop and add to Hamburg. Add slightly beaten egg, chopped onion and green pepper, salt, pepper and Chili sauce. If mixture seems too dry, add some of the liquid strained from the beans. Pack into a greased loaf pan, dot top with fat, and bake until firm and brown. Serve hot with tomato sauce. Temperature, 350º. Time, 1 hour. Pretty straightforward. I don’t know that I’m in a big hurry to try making it, but it probably wouldn’t kill us. I’m not sure what “Fruit Sponge” is, but a little Internet research suggests it’s a kind of fruit cobbler. 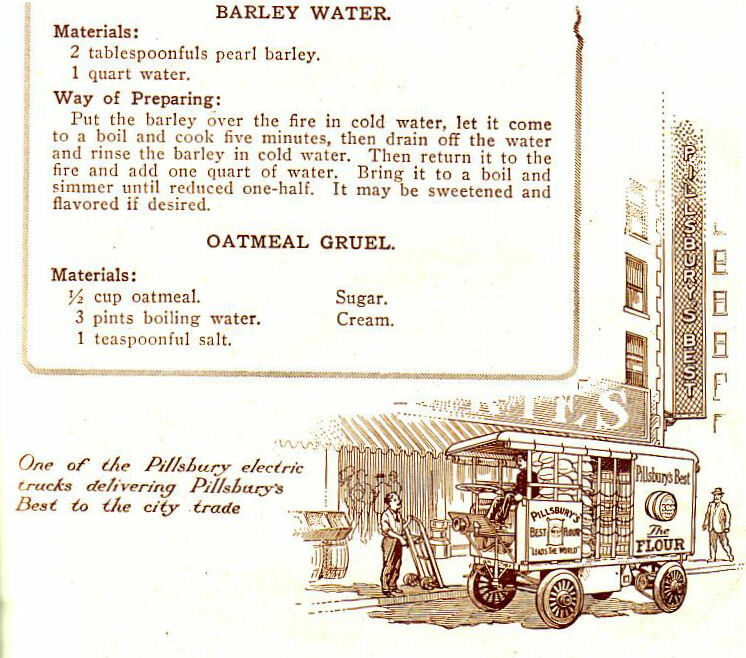 My other item for today is “The Pillsbury Cook Book” from 1914. It’s the kind that has a hole in the upper left-hand corner with a bit of string through it, for hanging the book on a nail in your kitchen. My copy is rather battered and torn, and is missing the index at the end (except for a piece that was stuck between the pages). It’s a fascinating booklet, though – one of the ones that assumes the reader will be interested in the whole process of the making, selling, and shipping of the product. So it’s full of line drawings and some photographs of Pillsbury facilities, ranging from the plowing of fields to, as shown here, pictures of an electric truck used for city transport. It claims 300 recipes, and also has menus scattered through it. Some of the illustrations combine photographs and line drawings to sometimes dubious effect. 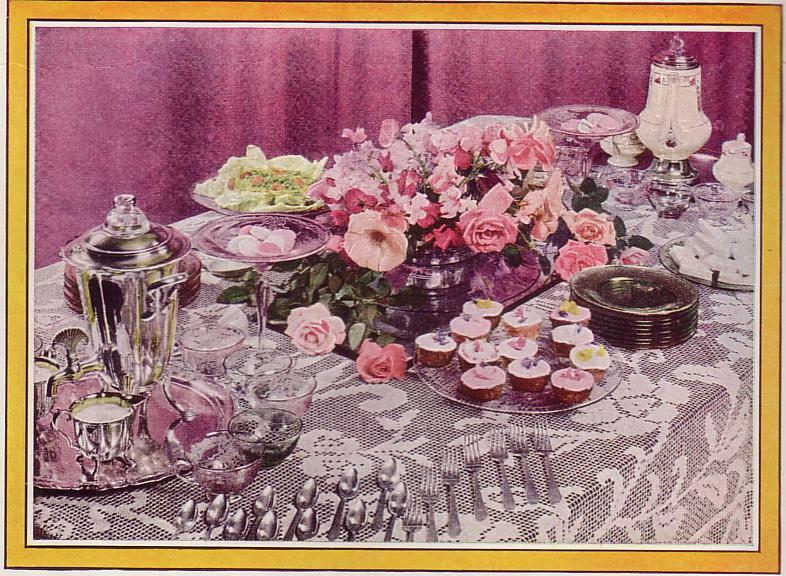 Here’s one of the “Luncheon” menus: Fish Croquettes with Tomato Sauce, Corn Meal Muffins, Rice Pudding, Tea. And some of the recipes – it is not just a baking cook book. Cream the flour and butter. Put the milk in a double boiler, and when it is at the boiling point add the flour and butter. Stir until it is smooth and thick, and add the salt, pepper and fish, flaked. Spread on a platter and let it cool. Then shape, roll in flour, egg and crumbs and fry in deep fat. Arrange on a hot dish, and garnish with parsley and sliced lemon. This will serve six persons. Cook the tomatoes, celery, onion, parsley and bay leaf twenty-five minutes, strain and return to the double boiler. Cream butter and flour together, and add them to the previous mixture, then add the beef extract and salt and pepper to taste. It is then ready to serve. If thicker than desired, thin with boiling water. Seems like kind of a production, but might be worth trying! You bet! Gasoline, steam, and electric engines were all in play at the beginning of the Automotive Age. I can’t recall at the moment why the gasoline/internal combustion engine won out.